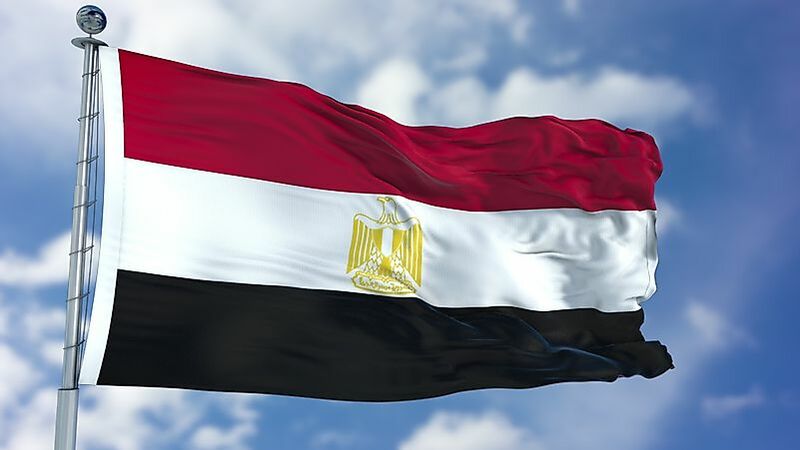 What Do The Colors And Symbols Of The Flag Of Egypt Mean? The flag of Egypt was adopted on October 4, 1984. The flag of Egypt features a golden Eagle of Saladin, Egypt's national emblem. Egypt is an Arab majority republic in North Africa. The country shares a border with Libya to the west, Sudan to the south, and Israel and Palestine to the east. Tourists from around the world visit Egypt to see the historical sites like the Pyramids of Giza and other tourist attractions. The country's flag is a symbol of Egyptian pride and receives the honor during important celebrations and in public spaces. EgyptianlLaw forbids the desecration of this flag and punishes any act through the penal code. The current flag comprises three colors; white, red, and black. In the middle lies the eagle of Saladin, which is the national emblem. The colors of the flag represent different circumstances that Egyptians have experienced. Abdel Nasser took over in 1958 after toppling King Farouk who had the support of the British. The red color, therefore, represents the struggle to attain freedom, the sacrifices that the Egyptian people made in their struggle for independence during the British occupation, and later on, in defense of their country in conflicts with enemies. The white color represents the bloodless nature of the 1952 coup that ushered in the Nasser era in Egypt. Black, on the other hand, symbolizes the period that the Egyptian people were under the autocratic rule of foreigners (the British) and later on the monarchy period. The eagle of Saladin is a symbol of Arab nationalism. The eagle symbolizes the strength, courage, and determination of the Egyptian people. The gold coating represents power. The Egyptian flag has undergone several transformations to its present state. At first, it consisted of a single color, red, a crescent shape and three stars. The design was used until the British began their occupation in 1882. The cross was added to the crescent and three stars to represent the Christian minority in the country. However, the move was deeply unpopular, and it raised nationalist resentment against the British occupiers. Upon independence, King Fuad 1 changed the color to green and excluded the cross. Green represented the agricultural activities taking place in Egypt along the Nile as well as in Sudan and Nubia, which were part of the Kingdom, which was also represented by the three stars. After the Egyptian free officers deposed King Fuad 1, the green background was replaced with a tricolor of red, white and black with the eagle of Saladin at the middle. Two green stars eventually replaced the eagle when Egypt and Syria united to form the United Arab Republic in 1958. Syria eventually withdrew, and the Hawk of Qureish replaced the two stars after Libya joined Egypt in a new republic. In 1977, the Federation of Arab Republics was dissolved, and in 1982, the Eagle of Saladin was restored to the Egyptian flag, and the red band was made darker to make it different from similar flags of Yemen, Iraq, and Syria. Gold was used on the eagle together with white. It has been in use since 1982.